As someone who a) drinks wine and b) owns a smartphone, like millions of other people, I assumed that certain critical factors in modern wine label design would be self-evident. Yet none of the articles I could find about designing wine labels mentioned them, even in passing. And even more tellingly, many of the wine labels I encounter fail to get it right. The digital era has imposed three vital aspects on wine-label design. I'm not saying that labels can't be successful if they break these rules (there are plenty of famous examples that clearly are); nor am I saying that these are the only important elements (the articles I read focus on colour, typography, style, graphics, and other important factors). But if I was going to design a wine label today, these three rules would be absolutely, fundamentally unbreakable. For wine labels, that means that all vital information (name, vintage, logo, artwork) should be easily captured in a 1:1 photograph on a smartphone. This will ensure that the wine is clearly identifiable on social media and should also improve its chances of quick recognition by apps such as Vivino. 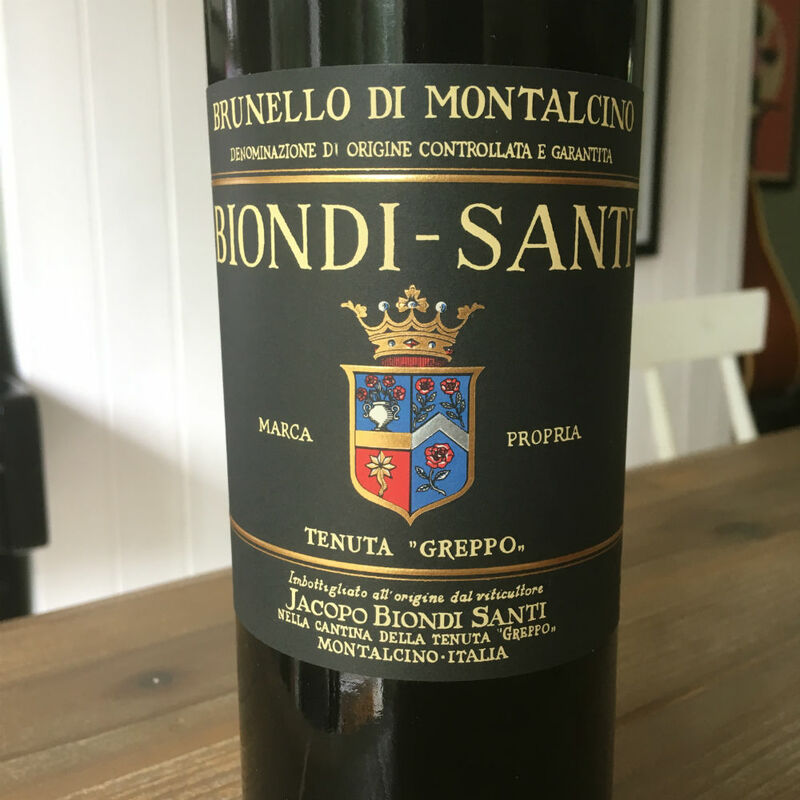 The width of this Biondi-Santi label means that the brand name is barely visible; and the placement of the vintage label on the steep shoulder means that a strong angle is needed to get both in the frame. To ensure that your wine has a good chance of being found on the internet, it pays to have a unique name. Terms like 'Reserve' and 'Winemaker's Selection' are so common and generic that they aren't easily searched for. Likewise for producer names such as Moulin-à-Vent (see The Game of the Name for more on this). For the same reasons, it's wise to use words that can be spelled phonetically and are in English, or at least easy to understand in English - since that is the main language of the internet (conveniently ignoring Chinese languages for the moment), and is also the language of at least two of the biggest export markets for wine. Some wines are famous for changing their branding and names every year. Sine Qua Non is probably the best-known example, who apparently never make the same wine twice, and therefore release unique cuvées every year (Hedonism in London has a very large selection). But for most producers, this is a bad strategy - and again, it's because of the digital era. Databases of wines are increasingly important in the wine world - for retailers, reviewers, wholesalers, apps and collectors - and releasing the same wine every year will help build a clean and comprehensive set of data, which builds up to create a bigger online footprint - rather than something more fragmented and inconsistent. There might be several named premier crus in this range too, which still fits into the structure, but things get more complicated when you get micro-cuvées of individual rows or plots within a vineyard, or special bottlings such as hommages or museum releases. Again, I'm not saying that such wines ought never be created; but that most producers should be conscious of how wine databases work, and design their ranges to be as compatible as possible with the requirements of the database age. Good label design involves lots of different factors, many of which I haven't covered here, and I have no training in design. But surely it's just common sense to ensure that wine labelling and nomenclature has maximum compatibility with the demands of the digital era.